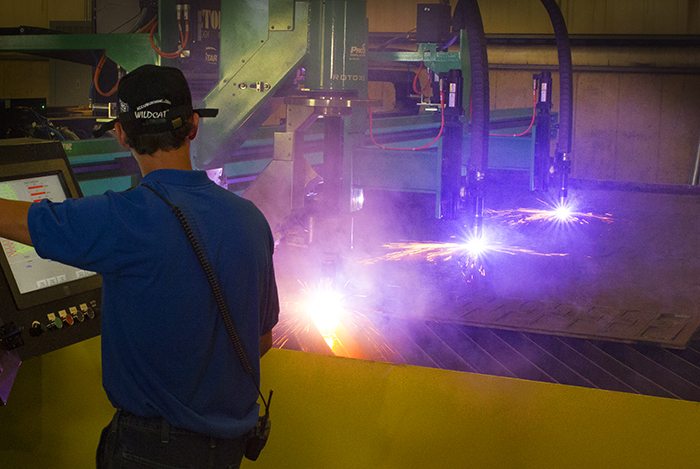 ACCUBURN IS PROUD TO OWN AND OPERATE ONE OF THE LARGEST PLASMA CUTTING TABLES IN THE UNITED STATES. At AccuBurn, Inc, we specialize in providing dimensionally accurate plasma cut parts with industry-leading turnaround times and very competitive pricing. Our powerful 400 Amp, three torch plasma cutting system features multi-axis control with beveling, and allows us to make high speed, high quality cuts through materials up to 1.5″ thick while holding ± 0.059″ tolerances. A large 25′ x 25′ work table combined with high capacity lifting equipment gives us the ability to create large scale work pieces weighing up to 15 tons, while intelligent nesting software offers productivity benefits such as chain, bridge, and common line cutting to optimize production speed and material usage. We maintain a large inventory of mild steels in a wide variety of grades, thicknesses, and tempers. Our strategic material purchases leverage the favorable price advantages of our high volume demands. Click on Plasma Specifications button to see full process specifications. Our ISO 9001:2015 certified quality management system incorporates detailed control plans and inspection checkpoints to ensure the accuracy and integrity of everything we produce. Material certifications, inspection reports, and other quality documents are available to accompany any order. We have a strong background in producing large structural components for heavy duty vehicles and equipment, and our value-based services accommodate prototype to high volume production projects. Along with short lead times, we offer next day service for projects with tight time constraints.